Walking the herd back to pasture for the first time. About a week ago we decided to combine the baby goat herd with the big goat herd. For the past 16 weeks the babies were managed separately as we slowly weaned them off milk and transitioned them to a grassfed diet. Most farms would wean the baby goats onto grain and hay, or a combination of grain and pasture. We decided to go straight to 100% pasture. 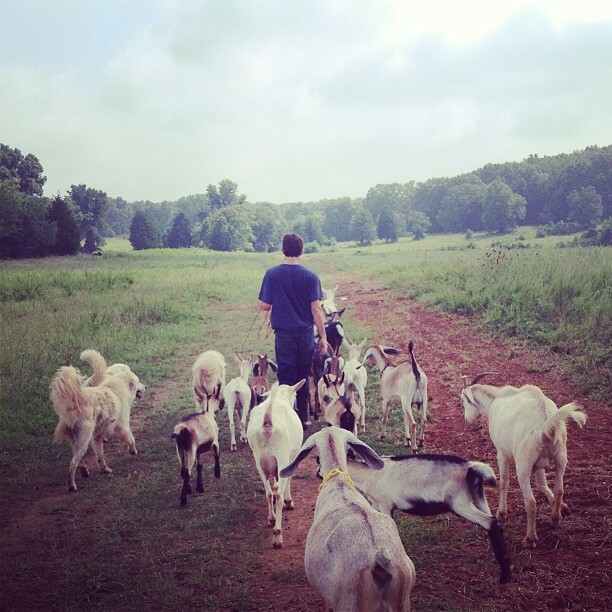 All of our goats that are not being milked are entirely grassfed. This is possible because of our rotational grazing system. We've found that purely grassfed goats thrive in our grazing system and maintain incredible health and body condition. Thus far the baby goats are exhibiting that dynamic. All of them look fatter and healthier than they ever did before. I love seeing a baby goat rumen at work, they look like little UFOs. Combining the herd is a big deal since we rely on the goats to walk and follow us for literally miles of completely open pasture. In preparation for incorporating the goat babies into our system, I rotationally grazed them for a few weeks on their own. They did great and I knew they were ready to be combined with the big girls. The little doelings get picked on a little a bit, but for the most part they get along fine. After a week they pretty much have the routine down and in a few more weeks it will be seamless, as it was previously. They grow up fast those little hellions.